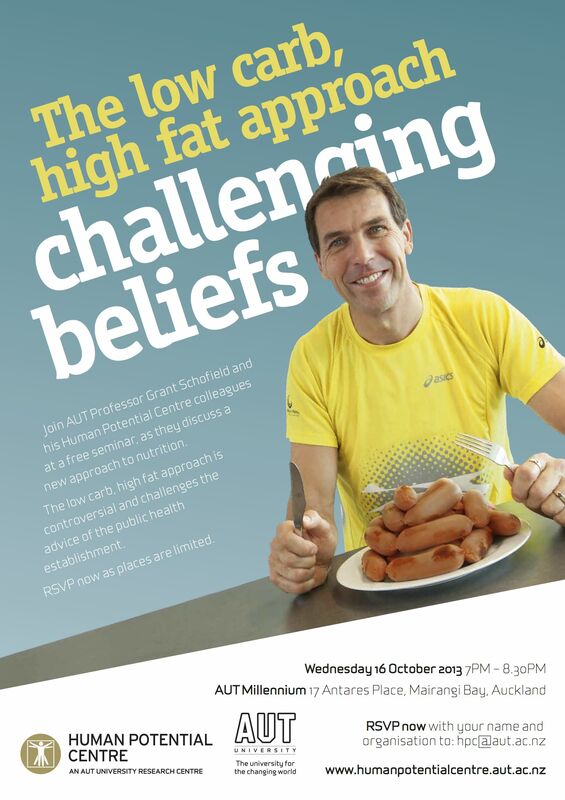 Join me and my research team to see the latest in the world of Low Carb HIgh Fat (LCHF) research and practice. We will look at what the research shows, what we are doing, and what this means in practical terms. We will be discussing both health (weight loss, diabetes, and chronic disease), and athletic performance. Get in quick to register if you are in Auckland as seats are free but limited. for those in other countries, will there be a video or a transcript available please? For those of us in other countries, will there be a video or transcript of this available please? Pity the picture doesn’t have a delicious piece of salmon with some buttered vegetables. The sausages look insipid. Yes I agree, that’s university artwork for you. Not that healthy, they wanted provocative!